Have you heard of The Minimalists? It inspired me to share with you some keys to living a more simple and stylish life :). You know (if you don´t, now you do ;) I’m a huge decluttering fan. It feels so good to get rid of stuff that’s not serving you anymore. How to get rid of clothes that don’t serve you and start paving the way to your ultimate dream closet?? When you visualize a dream closet, it’s got no space for clutter, am I right? But What am I going to wear if I get rid of everything I don't LOVE? If you don’t make space for great pieces to come into your closet, how are you going to attract them? Don't settle for less my dear, go for it!! Wouldn’t you prefer living on one capsule wardrobe? That’s a group of beautiful pieces that mix and match, (all your most favorite pieces by the way). Than having a closet FULL of clothes that don’t make you feel great!? If you add up how much you spent in those cheap clothes that don’t serve you anymore; I bet you can buy a pretty impressive high-quality wardrobe that you actually love wearing. Have you ever heard of the 80/20 wardrobe rule? Research shows that we only wear a 20% of all the clothes we have in our closet. Pretty crazy, huh? Stop for a second, and think about this: Don’t you find suspicious that every single year there’s a season where black is a MUST, sailor style is super trendy, and hair beach waves are a hit…??? These are just commercial strategies to create the need of buying to be in style...! I’d like to inspire you to start a movement, where YOU are the trend that rules in your closet. YOU set what’s trendy and what’s not. YOU are the inspiration for your clothes. Start honoring YOU, your personality and your beautiful body today. Get rid of all the stuff that’s not adding value in your life. 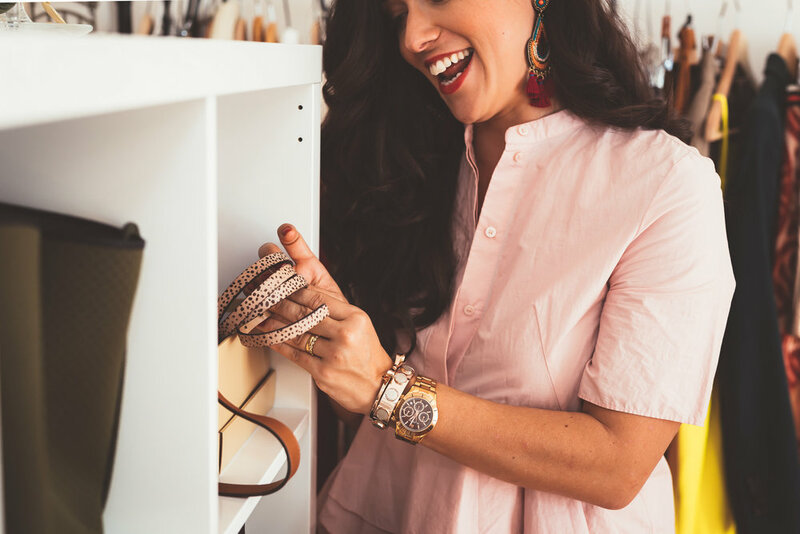 Start making a conscious decision to welcome into your closet pieces you LOVE. Pieces aligned with your soul and your awesome self. A closet that is connected to your value and complements your awesomeness!!! - Stand in front of your closet and say goodbye to pieces you haven’t worn in 2 years. Yes, I know you have lots of love towards them, but they’ve been around long enough. - Say goodbye to pieces that are not in good condition: torn, stained, worn out. - And also to all those pieces that don’t bring any spark into your life when you wear them. And after you make that brave decision, get out and find those pieces that you actually LOVE. You can go to this post, where I share with you a great way to find them, with my Power Shopping Formula. I’d love to know what you think about the idea of minimalism and being more selective about the stuff you bring home. I’d love to see your comments below. If it doesn't add value to your life, it's not worth the investment!